A new free playable class is now available for TERA on Xbox One and PlayStation 4: the stealthy, deadly ninja. The ninja is a brilliant strategist that relies on hit-and-run tactics paired with misdirection to confuse and eliminate her enemies. With a tactical mind that’s as sharp as her oversized shuriken, the ninja also heats up the battlefield with her ability to channel Chi into blazing fire that incinerates foes. All players will receive a free extra character slot upon first-time login to the game, so they can try out the ninja immediately. Starting on Tuesday, September 18, players will find a unique item in their Item Claim: the letter “N.” Completing Vanguard missions will yield Ninja Launch Letter Boxes that will provide these letters at random: S, H, U, R, I, K, E, N. Spell out “Shuriken” and earn a special ninja-skinned mount, the E-Line Coupe. Players who create a ninja will be able to take place in a special leveling event. Every 10 levels from 20 to 60, ninjas can open special leveling boxes containing useful rewards including XP boosts, enchanting materials, and consumable buffs. 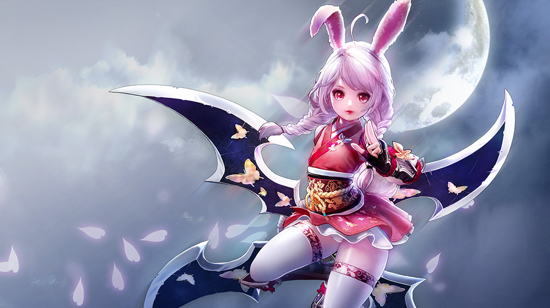 At level 65, the leveling box contains an exclusive Kunoichi Robe costume and a Butterfly Shuriken weapon skin. For more details on the special ninja events, visit http://tera.enmasse.com/news/posts/ninja-launch-events/.